HomeAdministrationHow do I hide things in Moodle? 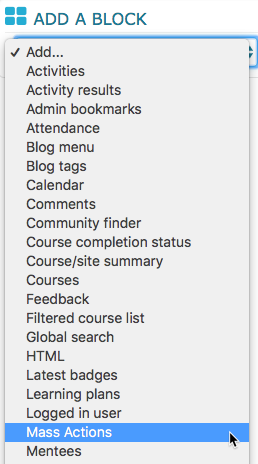 Scroll down to the Course Administration block and click Edit Settings. Click the dropdown next to Visible and select Hide. 4. Click Save and Display to save changes. *Your course will appear in your list of courses, but will be greyed out or italicized. *The course will not show up in students’ lists at all. (If it is nearing the start of the term, you may consider hiding topic sections instead of the entire course, so students see they are enrolled in the course, they just can’t see the content.) See Hiding Topic Sections. Turn editing on using the Turn Editing On button in the upper right of your screen or under the Course Administration block. Click Edit next to one of the topic sections you wish to hide and click Hide topic. *The topic will become greyed out and items within that topic will become italicized. 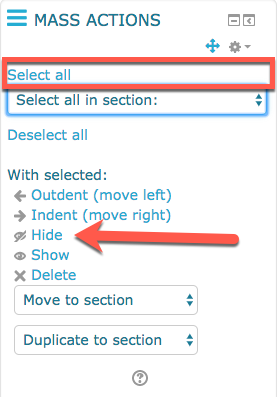 Click Edit next to one of the activities or resources you wish to hide and click Hide. *The activity or resource will now show the eyeball with a slash through it. To make the item visible again, click Edit and then click Show. Click Edit next to one of the topic sections, activities, or resources you wish to hide and click Edit topic, Edit Section, or Edit Settings. 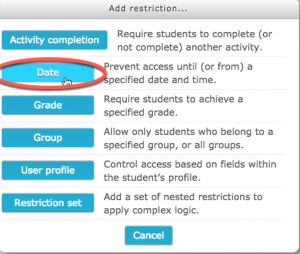 Scroll to Restrict Access, expand the section using the arrow and click Add Restriction. Select Date on the add restriction type page. Set the Date and time, change from to until, and click the eyeball to hide the activity until that date. See below. *The topic section, activity, or resource will remain hidden to students until the date and time set here. At that time, it will automatically become visible to students. To hide multiple topic sections or content at once, use the Mass Actions Block. Turn Editing On for the course. Scroll down the course page and click Add a block on the right hand side of the course. Select Mass Actions. Scroll back down to that block, click Select All and Click Hide. *This will hide every topic and item in the course. To make certain sections or items available, reverse this process by selecting all or certain sections from the dropdown menu, then selecting Show. Hiding grades from students takes many forms. For a break down of these options, click on the links below.